Artwork Panel: 23cm x 57.3cm ≈ 9" x 22½"
Silk/Brocade: 32.1cm x 114cm ≈ 12½" x 44¾"
Width at Wooden Knobs: 41.1cm ≈ 16¼"
While this is a newly created wall scroll, the text of this calligraphy was written about 1664 years ago. 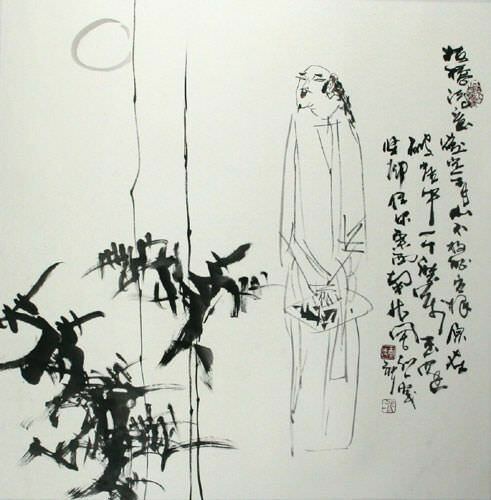 This calligraphy depicts a sort of poetic article or prose that describes a poetry event at the Orchid Pavilion. Included are various emotions, thoughts, and other feelings of the author, Wang Xizhi. This article has many title variations. Sometimes known as Lantingxu (蘭亭序), Landtingjixun (蘭亭集序), or Lantingji-xu amoung a few others. 脩禊事也。 xiūxì shì yě For the Spring Purification Festival. 少長咸集。 shào zhǎng xián jí From old to young. 映帶左右。 yìng dài zuǒyòu Reflecting the sunlight as it flows past either side of the pavilion. 引以為流觴曲水，列坐其次； yǐn yǐ wéi liú shāng qū shuǐ, lièzuò qícì The guests are seated side by side to play the drinking game where a wine cup is floated down the stream and the first person sitting in front of the cup when it stops must drink. 一觴一詠，亦足以暢敘幽情。 yī shāng yī yǒng, yì zúyǐ chàngxù yōuqíng With a cup of wine here and a reciting of poetry there, it is sufficient to allow for a pleasant exchange of cordial conversations. 足以極視聽之娛，信可樂也。 zúyǐ jí shìtīng zhī yú, xìn kě lè yě Is enough to reach the heights of delight for the sight and sound. What a joy. 或因寄所托，放浪形骸之外。 huò yīn jì suǒ tuō, fànglàngxínghái zhī wài Still others will abandon themselves to reckless pursuits. 快然自足，不知老之將至。 kuài rán zìzú, bùzhī lǎo zhī jiāng zhì And will feel content, but he is not mindful that old age will soon overtake him. 感慨係之矣。 gǎnkǎi xì zhī yǐ And will thus be filled with regrets. 况修短隨化，終期于盡。 kuàng xiū duǎn suí huà, zhōng qī yú jìn In any case, the length of a man’s life is determined by the Creator, and we will all turn to dust in the end. 古人云﹕「死生亦大矣。」 gǔrén yún: sǐ shēng yì dà yǐ The ancients have said, "Birth and Death are both momentous occasions." 豈不痛哉！ qǐbù tòng zāi Isn’t that sad! 不能喻之于懷。 bùnéng yù zhī yú huái And I can not explain why I am saddened. 齊彭殤為妄作。 qí péng shāng wéi wàngzuò And it is equally absurd to think of dying at an old age as being the same as dying at a young age. 後之視今，亦由今之視昔。 hòu zhī shì jīn, yì yóu jīn zhī shì xī When future generations look back to my time, it will probably be similar to how I now think of the past. 所以興懷，其致一也。 suǒ yǐ xìng huái, qí zhì yī yě As for the things that we regret, they are the same. 後之攬者，亦將有感於斯文。 hòu zhī lǎn zhě, yì jiāng yǒu gǎn yú sī wén For the people who read this in future generations, perhaps you will likewise be moved by these words. This calligraphy was done by Master Calligrapher Sun Jian-Ping of Jinan in the Shandong Province of Northern China. This is a special piece because of the "xiao kai" or "small character" calligraphy. A lot of information in here in a small space.